I’ve written about orographic clouds before, so if you want to fully understand the meteorology involved (and see an awesome photo) just follow that link. In this post I want to share a recent example from our location in New River. The New River Mountains (right edge of photo) rise to over 1500 meters (5000 ft). The New River environs is around 600 meters (2000 ft). The view here is to the north. Prevailing winds in our area come from the southwest. When humid air flows in from the coast it’s forced to rise as it encounters the foothills. As it gains altitude and encounters lower air pressure the air expands and cools. At some altitude the air temperature will fall below the dew point, triggering invisible water vapor to condense into tiny (10 micron) light-scattering liquid droplets — a cloud will be born. In my photo you can see this transition altitude visible as the well-defined bottom edge of the cloud layer. 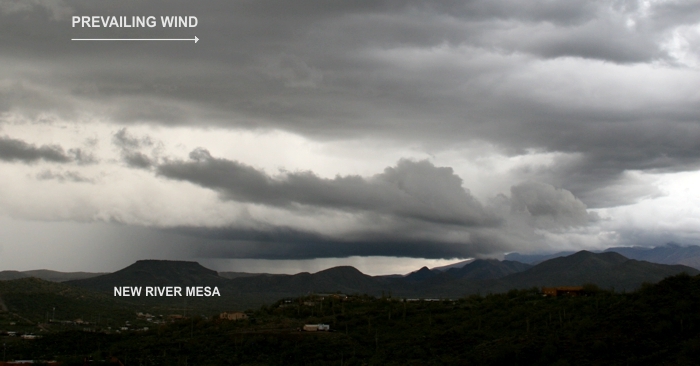 This air mass is producing rain over New River Mesa, and that reduces the air’s humidity. Farther along into the mountains the clouds remain visible but lack sufficient moisture for precipitation — unless the air rises to even higher altitudes. This is why deserts are often found on the leeward sides of tall mountain ranges. The Atacama Desert (sometimes called the “driest place on Earth”) is a classic example. It’s just downwind of the 4000 meter (13,000 ft) Andean Mountains. Notice how some of the mountain summits are enveloped by this orographic cloud. If you were on one of those summits you’d be surrounded by fog — a relatively rare occurrence at ground level in the desert. This serves to remind us that what we call “fog” is simply a cloud with an altitude equal to our elevation. I first had that epiphany as a child. We were traveling by car through a rural area of Wisconsin not far from Lake Michigan. As we went down a slight incline into a valley we hit a wall of fog so opaque we had to slow down. 30 seconds later as we climbed out of the valley we broke through the fog back into clear air. I asked my Dad “What was that?” He replied “Just a bank of fog.” I asked “But what is fog?” He replied “Just a cloud on the ground.” I recall being startled by that — I mean, clouds are supposed to be floating around up in the sky. Was this one broken or defective? How could that happen? I didn’t press for answers to those questions, but I wondered about “crashed” clouds for the remainder of the drive.